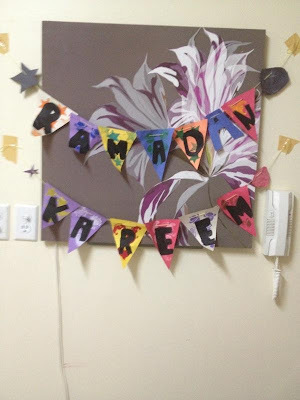 The second activity on our list is Ramadan banner. I got some inspirations for this from here and here. Let's get on to the materials needed. Colored scraps of paper. They could be any kind. Plain, self designed the world of crafting paper is your oyster. Stencils. If you are using a plain paper and want to decorated the background. First thing we did was cut the required number of paper in triangles. We wanted to decorate the background so we used a sponge stencil. Stamp your triangles and set them aside to dry. After the paint is dry add on the letters to RAMADAN KAREEM. This can be done in many different ways. We painted ours. You can cut out letters and paste. Do it with a marker. The last part is stringing them. We used left over yarn. I lost my yarn needle so we improvised by putting a little tape at the end of the yarn making a little sturdy so it will be easy to thread. We made holes in the top of the triangles with a pencil. You might be a little organized than me and use a punching machine if you want but pencil works fine too. Thread the banner and find a place to hang it. Math: He had to count the alphabets used in making the banner add them up and tell me how many triangles we needed. Fine motor skill : He had to cut the triangles, stamp the design on them, paint the letters and string them. English: He learned to spell Ramadan Kareem. We talked about where to place the banner. It was his decision where it would go. My effort to make him a bit confident in making decisions and displaying his creations. Please keep in mind the activity is not suppose to be perfect. If it ends up being perfect for you. Hats off to you and your kid. The activities main purpose is the child's learning. Kids might not be willing to complete the task to the tee. My son cut only 4 triangles, stamped half the triangles and only painted Ramadan. The rest was finished by me. But I did it while he was sitting with me. So it seemed that we were doing it together. Talk to the kids while doing the activities. What do they think about it? What would they like to use next time if they did it again? Tell stories about prophets. Make the most of your time together. I hope you will enjoy doing this activity with your kids. Do let us know and share your experience with us.